Houston’s collaborative dance and live music performance company Group Acorde, premieres Origins at MATCH box 1 in January 2019. Group Acorde came to life with the desire of Roberta Paixao Cortes, Thomas Helton, Lindsey McGill and Seth Paynter to be a group that truly collaborates in all aspects of the creation process. These four artists have been creating and performing in the Houston arts scene for many years and decided to come together with the intention to produce high quality work combining original music and contemporary dance choreography, where all artists conceptualize the works from beginning to end. This is Group Acorde’s second full evening production and will feature all new collaborations. This project is a recipient of the City of Houston through Houston Arts Alliance project grant “Let Creativity Happen”. In its two first seasons, the company has performed at two well established Houston festivals, Barnstorm Dance Fest 2016/2017 and The Dance Month at the Kaplan Theater, performed at East Meets West at Miller Outdoor Theater and partnered with different organizations such as Nicole Longnecker and Plus Fest creating site specific works. 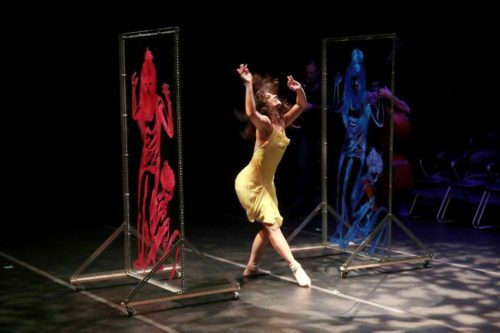 In its third current season, Group Acorde has performed at Fringe Festival and was one of the companies to present at the Contemporary World Festival at Discovery Green. Group Acorde has offered several “pay what you can” classes as a way to reach out to the community, and now in its third season, ambitiously brings three different art mediums together for all original collaborations. Group Acorde’s mission is to cultivate and educate audiences through live performances. The company strives to broaden its reach by partnering with other organizations that can guide them to communities that may not otherwise have access to such opportunities.